L: 80" x W: 60" x H: 10.5"
ON SALE $349.00 Was $449.00 Select mattress and base options to see price. Sealy Essentials Hillside Road Plush Queen Mattress Both comfortable and supportive, the Sealy® Essentials Hillside Road plush queen mattress offers an amazing night's sleep. SealyCushion™ Air Foam will have you feeling like you're floating as you rest. But make no mistake, the SealyResponse™ coils and SolidEdge™ HD System ensure you'll have plenty of support. Both comfortable and supportive, the Sealy® Essentials Hillside Road plush queen mattress offers an amazing night's sleep. SealyCushion™ Air Foam will have you feeling like you're floating as you rest. But make no mistake, the SealyResponse™ coils and SolidEdge™ HD System ensure you'll have plenty of support. L: 80" x W: 60" x H: 19"
Sealy Response™ coil provides a balance of comfort and support. Knit fabric with 1" SealyCushion™ Air Foam promotes air flow and adds softness. 2.5" Convoluted SealySupport™ firm foam and 1" SealySupport™ firm foam delivers stable, all-over support where you need it most. SolidEdge™ HD system maximizes the usable bed surface and creates a solid edge for sitting. I have bought this mattress before. It is comfortable and durable. 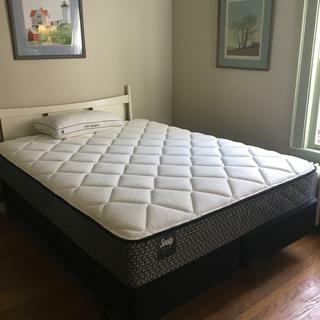 I bought these mattresses for 3 bedrooms this year and Sealy Essentials Hillside Road Plush has exceeded my expectations. I initially bought one for the guestroom, and after discovering how comfortable it actually is, I decided that this would be sufficient for all of the bedrooms. I also purchased the split queen foundation which made it easy to get upstairs and maneuver thru the hallway. These are affordable and well-made. I had a higher budget, but once I saw these in person and then purchased a set, I did not see a reason to pay more. Raymour & Flanigan always delivers on price, quality, customer service and delivery, which is why they are always my first go-to which it comes to furniture. Mattress felt softer in the store. Not quite as soft as I would like but a decent mattress for the price. I would shop Raymore and Flannigan again. Great mattress for my guestroom. Feels very comfortable & Plush! Needed mattress for spare bedroom. Perfect! Saleswoman very helpful in getting us what we needed for the price we requested. Considering the price I paid I am very happy with my purchase. My in-store consultation was also fantastic. (Metro Mall, Queens, NY). Overall very happy and would shop with Raymour & Flanigan again! First mattress bought too high, this one just the right height. Not as soft as I would like but I am adjusting. Great mattress, it is very comfortable and my back doesn't ache with this one. Very good quality for a low price. I was so confused on where to buy. Of course everyone's first thought is probably a franchise that has mattress in its name. When I went ti Raymore & Flanagan I was greeted when I entered. All I had was a picture on my phone and was skeptical of the price. I also had questions about all the new options since it had been years since I purchased a new mattress. My sales person had me sample all the options. Plush, Memory Foam, Firm, Pillow Top - them all. I wanted to see what queen looked like compared to king. I asked about headboards and sample sales. She was patient and answered ALL my questions. I was definitely up in the air about what kind of frame to buy and she helped with that as well. I am extremely happy with my bed, salesperson and expected time of delivery! Everything went as planned and I do not regret this purchase. I saw professionalism at its best at the 125th street location. I will in the very near future ne purchasing more furniture from this location. Bed is comfortable and worth every penny of the SALE price that I paid. 2 names really does say it all! We bought this mattress for our RV. It’s plush but firm. I’m sure we will love it when camping season begins. Very comfortable!! Comfy mattress best bargin for the price. A year later still feels like new. Comfort and quality! The mattress speaks for itself in terms of softness. Just as I thought the delivery was excellent...the mattress was the cherry on top. Will consider buying more from R&F. And also shout out to Dave. He was a very nice and helpful person and also quite knowledgeable about the mattresses. Just the right fit !! My son loves his new Sealy mattress. He loves that it's bigger than his old twin and he says it's very comfortable! Thank you for the easy purchase, easy delivery and set up and the price was great! I’m very pleased. It’s comfortable, great price and highly recommended. It’s so comfortable; I love it. Yes it's very comfortable. I sleep like a baby every night!! lol I had my doubts at first when in the store but I was trying to get the best bag for my buck and I'm so happy that I went with this one!! Definitely worth it ! Very comfortable - we are pleased with our purchase. In addition, it is a good value for the price - definitely recommend it. I already bought this mattress in full size. Like the first one, the queen was perfect from the first night. I’m sleeping like a baby. Very comfortable and supportive. I slept like a baby. I highly recommend this mattress. Great purchase. LOVE it. Slept 11 hours the first night!!! Love it! Wish I had purchased it earlier. I bought this mattress for a spare bedroom. I will not be sleeping on it but guests will. I have had one guest to date. He slept well. It was firm and comfortable. Quality mattress. The price point is reasonable. I have overslept several nights in this new bed!!!! If you add on the Platinum Protection Plan for any mattress and are not completely satisfied after 30 days, you have the option to reselect a mattress with the assistance of a store or showroom manager. Keep in mind that it may take a few weeks for you to break in your new mattress. So allowing the 30 days, gives you a good indication of how your mattress should feel long term. Should you have additional concerns or need immediate assistance, please feel free to reach out to rfcare@raymourflanigan.com with your order details and we will address your concerns. Does this mattress come packaged in a box? No it didn’t come packaged in a box, it was in plastic. It’s by far the best mattress that I’ve had in years and I get good deep sleep on this mattress. Absolutely no regrets! I used their delivery option which is the white-glove, in-home furniture and mattress delivery service. They brought the mattress in and set it up, so it was not in a box. We were home for the delivery. I believe they took it out of the box before removing it from the truck. But, it was packaged in thick plastic wrap. It wasn’t in a box when it was delivered. No. Was not in the box when delivered. No but it’s wrapped in plastic.